Anambra governorship election, the Resident Electoral Commissioner, Dr Nkwachukwu Orji, has said. Orji told the reporter in Awka on Friday that 10 security operatives would accompany the materials to the Registration Area Centres. He said that security operatives would secure the materials until Saturday, adding that the Police had pledged its commitment to the Commission during the exercise. “We are hopeful that the police and other operatives will make good their promise,’’ Orji said. We recalls that all non-sensitive materials for the election were distributed on October 30, while sensitive materials were sent to INEC offices in the 21 local government areas on Thursday for distribution to the RACs on Friday. A correspondent monitoring the exercise reports heavy security presence at the various council areas from where the materials were being conveyed to the RACs. Also, INEC ad hoc workers were seen checking their names and placements for the governorship election. Party agents of only five political parties — PDP, APGA, APC, UPP and ACPN — were at Njikoka, Dunukofia and Awka South council areas. Reacting to the exercise, the APC party agent, Mr. Donatus Emecheta, said the distribution of the election materials was smooth. Party agents — Mr. Onuorah Iyizoba of PDP and Mr. Ikem Oliobi of UPP — corroborated Emecheta’s views, adding that there were no challenges so far. Similarly, Mr. Chinedu Anaekwe of APGA said he was satisfied with the peaceful distribution of the sensitive materials and expressed the hope that the election proper would also be hitch-free. The Electoral Officer for Njikoka council area, Mr. Obioma Onuiri, said everything was moving as planned, adding that security officers were on ground to protect the ad hoc workers. 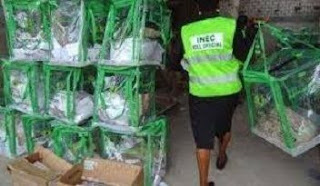 Also commenting, INEC officer from Kogi State, Mrs. Ubaku Ugwunebo, deployed as a RAC Supervisor for wards 3 and 4 in Abagana community, said the environment at the moment showed positive signs of a peaceful election. The situation was not different at Dunukofia and Awka South, as the activities were smooth. The electoral officers at Dunukofia and Awka South, Messrs Onyeji Victor and Okikie Chinedu, also noted that the distribution of the sensitive materials was without hitch. The sensitive materials were received by INEC on November 16 from the Central Bank of Nigeria, Awka branch, in the presence of party agents, election observers and the media. Also, the distribution of sensitive materials to local government areas in the state was clustered into five groups based on distance, terrain and voter density.